The global nation-state based system is in deep crisis. The West’s relative decline is obvious, except to the West itself. This multi-dimensional crisis will, of course, give way to something new – but what? Lack of vision – sometimes even of knowledge and empathy – among those in power seems a defining characteristics of our times. Individually as well as nationally, we are living in iTimes, not weTimes. Add to that blowbacks from history and Western knee-jerk militarist responses – and the next few years will be tough. The creativity and innovation we find in commercial and social entrepreneurship and in the arts, seem frighteningly absent in the world of politics. Who would get elected anywhere on having an exciting vision for the the world the next 25 or 40 years? No, you must know about national affairs and economy – while, by the way, national economy doesn’t exist anymore. Few young people, including students or young scholars, find it attractive to join party politics. But can humanity survive with only criticism, negative energy, bad news and no vision? Will we work for a better world if we can’t see it? Dr. Johan Galtung has devoted his life to the vision of a less violent, more peaceful world – from the local to the civilisational level – implementing the norm of the Charter of the UN – turning 70 on October 24, 2015 – that peace shall be established by peaceful means. 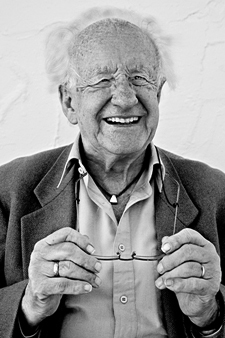 Galtung – one of a handful of peace visionaries with a macro perspective – himself turns 85 on UN Day. He has mediated in more than 100 conflicts since 1957 and published 164 books. And he still travels the world speaking and writing. More about him here by Antonio. C. S. Rosa. He is one of the youngest and most innovative minds in world affairs, always asking the essential, healing question: What can be done? That’s what the good doctor does – helps conflicting parties address their problems, reduce their violence and develop a vision of a better future – together or side-by-side with respect. Making the seemingly incompatible more compatible through creativity, dialogue, vision. Here is his latest column – which TFF publishes every week. It synthesizes where we stand and ought to go. National Evangelism, the US Protestant Christian civilization – more national than evangelical – justifies US warfare as exceptionalism of a people chosen by God, with a manifest destiny to run the world. Orthodox Judaism justifies Israeli warfare to conquer and expand from Nile to Euphrates as a religious right and duty to the Eternal One. But the root cause of global disorder lies in the Occident – with Islam – seeing itself as the single, universal civilization valid for all at all times, all others being mistakes. Missionary activity, slavery, colonialism, exploitative trade, robbery capitalism, follow. The ways out pass through softer Christianities and Judaisms, through no military aid for the USA or Israel, through boycott and other forms of resistance; but above all through alternative policies. For the USA to retreat to a North American Mex-Us-Can, for Israel to a UN-guaranteed state in the WANA, West Asia-North Africa region, in the old millet autonomy tradition of the Ottoman Empire. Like people informed of impending death they both deny any crisis in their world and regional empires. But reality strikes back, denying the denial. More adequate steps will be taken, maybe before 2020. In Europe a European House for the European Union and the large Russia+, for the four tasks. In that House U-kraina – at the 1600 years old Catholic-Orthodox border – could be a federation with rotating presidents, neutral, gas-oil flowing from East to West, EU trade from West to East, and Crimea 2014 understood as a correction of 1954. The Islamic State is a region. Russia makes a mistake killing them: kill one, get 10 more, also from inside Russia. Like the attack on Afghanistan 1978-79: “There they go again“, Muslims say. Something for everybody to learn everywhere. A Völkerwanderung; whole peoples on the move – 50 million, for 50 years? From Africa devastated by slavery, colonialism, trade, capitalism, from Africa and West-Central Asia from wars mainly by the West. We get a search for livelihood, for maternal care from colonial Mother Countries, as uninvited settlers like the colonizers, but willing to abide by local norms. The solution? Africa develops itself, like East Asia once did using the Japanese model, not Smith-Ricardo but Kaname Akamatsu used by China, but unacknowledged. Gaddafi favored that model but was killed. The role of the EU? Host millions even if only to compensate for low European fertility; otherwise stay off, apologize, compensate. The West has done enough damage in the world! It’s time and much better – that it reinvents itself.